These holidays were just as unproductive as the last few, if not all that boring. My college decided to shorten these winter vacations as compared to the last 2 years. Where it was a solid 30 days last year, it came down to simply 27 this year (Sad, I know) 😦 … But all that apart, I spent most of those 27 days doing something or the other to rid myself of boredom. My book reading took a back seat though. I bought 3 books – Life of Pi by Yann Martel, Surely You’re Joking, Mr. Feynmann (Yes :D) by Richard Feynmann (the man himself) and Nine Lives by William Dalrymple. I’ve started reading Life of Pi and seem to be crawling through the book even though I can see that it is one of the most interesting stories I’ve read in a very very long time. The other 2 books will have to take a backseat. I finished 2 of Agatha Christie’s Hercule Poirot novels – Death in the Clouds and Hercule Poirot Christmas. There is really nothing to say – Agatha Christie is the best crime writer I’ve read in a very long time. Although when you look for pattern in her novels, you find one concerning the killer and the motive, the modus operandi is completely different each time. I have a feeling she wove her tale backwards from how the murder is staged. Also, I got some Isaac Asimov reading done. I finished the third book in the Robots in Time series and am in the fourth one. It is fairly engaging but not exactly something to keep you hooked. The TV shows have been caught up with. They have been put on hold thanks to the holiday season but no worries .. They shall start again in January. i haven’t seen many movies these holidays either. Of worthy note was Scott Pilgrim vs the World which was frankly speaking, a very weird movie but it was funny as hell, no doubt about it. And also, I went to the theatres and saw Ratha Charithram or some similar named movie. It basically sucked. And then, today ..
Harry Potter and the Deathly Hallows Part 1 : The movie was actually pretty good compared to its predecessors. Apart from the usual extravagance a story with “magical” potential gives special effects a chance to have, it was directed with just enough action and emotion to keep it from becoming complete crap .. but I didn’t enjoy it. I can impartially rate movies since one part of me is always attentive to something so big going on in front of my eyes. The other part made it hell, considering I was sitting near an ABSOLUTE douchebag and the fact that the theatre had a lot of local crowd who basically came there to gawk at Emma Watson and make comments about a movie they could’ve hardly understood beyond the Harry Potter part. After the movie, douchebag and another friend of mine revealed that they had about 1350 bucks worth of free gaming left for Blur 😀 .. Starting from Air Hockey (which I own’d) till playing car race on LAN in an Arcade (which I own’d as well) and playing Tekken 6 (which douchebag obviously own’d) and other minor arcade games, we had a lot of fun for the money. Apart from all the fun and frolic, I’ve been preparing for CAT *snorts* , learning python (holy crap, whatte language) and trying to start on writing stories. The holidays will end this Sunday when I shall leave for college early in the morning. And then, another semester will begin where I will yet again pretend to struggle for gaining academic merit when I know it hardly matters anymore and will develop my hacking skills to another level entirely (hopefully). Finally, my holidays are here. FINALLY! I dunno how long I’ve been waiting for this one. So .. I thought about when and if I should blog again. I thought a lot and then, I thought, let’s do it. What does a holiday entail to a hyper active teenager who is going to be not-a-teenager in a matter of months? For me, it means gaming (a lot), some book reading, some movies and trawling the net and wikipedia alternatively for internships and random information respectively. This might be the one vacation that I truly plan on using productively. But, when you think about the fact that this may be the LAST vacation I ever have, I feel I should rethink that particular stratagem. Shantaram, as I typed before, is about a heroin addict who escaped from Australia and came to India and fell in love with the country. To say the book was good would be an understatement. It actually left a profound impact on me. The highlight, as I mentioned before, was it’s deceptively simple language. The other highlight I found upon further delving into the book, was the fact that the author was very philosophical in the way he looked at the world. In fact, there are some particular lines in the book – parts in which the narrator is pondering over some worldly aspects of life – when it gets really profound and then you realise, the author is actually right about what he is saying. My tweet about the book being awesome got a –1 on a RT (thanks @shridharama) which I partially deserve because I mentioned that it may be close to LotR, which, now I come to think of it, is just absurd. The book tracks Roberts journey from coming to India and living in a Marathi village, moving to the slums of Bombay, opening up a free health clinic there, acting in bollywood, working as a street soldier for the Bombay mafia, fighting alongside the Mujahideen in Afghanistan and a lot more. Should you read the book – Hell Yes! Now that those 2 books are ticked off my reading list, I’m getting back to Isaac Asimov and books in his series that other authors have written. Following the chronology can get really boring with this author considering that his science and his stories make perfect sense – unlike any of the H2G2 series. Right now, I’m reading a book written by William F Wu about Robots in Time. It’s the third book in a series of 6 where robots get lost in time and a team of 3 humans and one advanced humanoid are sent in search of them. The reason all these books fall under the chronology of Isaac Asimov, is that the robots in the books always obey the 3 laws he set down. Those 3 laws are so famous, in fact, and so quintessential that all AI systems are planning to be made on their basis. But Asimov’s interpretation of his laws was a lot different than what this author does. William Wu goes so deep into those laws, you sometimes wonder if such complex AI systems aren’t human in themselves and if the paradoxes and difficulties they encounter will simply not lead to a machine rebellion that so many movies depict. I’ve seen only 2 good movies since the last post – “Stranger than Fiction” and “Tron”. “Stranger than Fiction” is a superb movie. Having a storyline unlike anything I’ve ever seen before, the movie was very well taken. All B Grade actors except for one guy who looked remotely like Alec Baldwin. I expected a better climax but I could’ve settled for this one anyway. Must-watch! 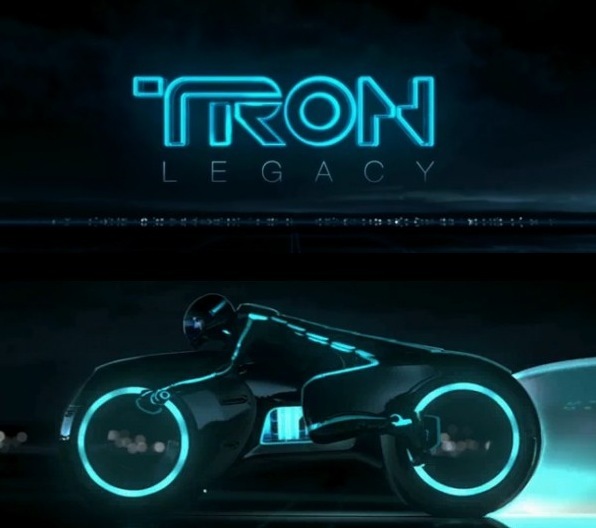 I watched Tron mainly because I wanted to be able to follow the storyline in the sequel coming up called “Tron: Legacy”. Yep, that’s how the majority of the movie looks like. That, btw, is the game of “Lightcycles” which is a very very important part of the movie. No spoilers though. For true nerds, the movie is an epic. It marked a totally different type of out-of-the-box thinking.Giving personalities to programs and creating protagonists and antagonists in a plot that concerned the internal workings of a computer was a major breakthrough in unconventional thinking. Consensus: If you’re a nerd, I beg you to watch this. If you’re not a nerd, give this a miss. The holidays have also marked the return to the world of TV Shows. I’m still following Big Bang Theory, How I Met Your Mother, Dexter, Chuck and Lie to Me. To say the least, Dexter seems as epic as ever and Chuck seems to be getting better and better guest stars – what with Linda Hamilton, Timothy Dalton and all that. PS: Hashtagging should be made a search engine base for the whole internet, I swear. Metadata tagging is so yesterday.